Part of a 1924 building at the edge of Selegie Road will be demolished, and later rebuilt, to make way for the construction of the North- South Corridor. This is despite the Ellison Building's status as a conserved structure gazetted by the Urban Redevelopment Authority (URA). The authorities described the decision as an "exceptional course of action" that was taken after considerable study and deliberation by the agencies. They said it was a last resort after concluding that it was not possible to completely avoid the building "in order to realise an important national infrastructure". Three of the building's 16 two- storey units will be torn down. The affected units - 235, 237 and 239 - currently occupied by a mama shop, Colonial Bistro Cafe and part of a fruit shop, are along the building's curved facade. The Land Transport Authority (LTA) said it will reconstruct and reinstate the affected part of the government-owned building to its original architectural design, under the URA's guidance, once construction of the tunnel is completed in 2026. "Protective measures will be put in place to ensure that the structural stability of the rest of the building is maintained when the infrastructural and reinstatement works are carried out," the agencies said in a joint statement. The Singapore Heritage Society said it was "deeply disappointed" with the decision to demolish and then reconstruct a substantial part of the conserved building. Its spokesman said: "Reconstruction is not a good option because it is the falsification of historical artefacts." The society said reconstruction typically results in simplification of a structure's original architectural features. It wants other options explored, and called for heritage impact assessments to be carried out, for this report to be made public and for consultation. According to URA conservation guidelines, the fundamental principle of conservation applicable to all conserved buildings is "maximum retention, sensitive restoration and careful repair". Weighing in, Singapore Management University heritage law expert Jack Lee said the conservation scheme was designed largely to prevent private property owners from dealing with conservation properties without the permission of the authorities. The Ellison Building was built in 1924 by Isaac Ellison, a Romanian Jew. It could have been built for his wife Flora, a Baghdadi Jewish woman from Rangoon, the former capital of Myanmar. The building has two domes and balconies. The Star of David, the Ellison name and its date of construction still sit proudly atop the relatively rundown building. Lying at the foot of the Mount Sophia conservation area, it is located within the former Jewish quarters. The Straits Times understands that the Ellison family is no longer based in Singapore. Some records also indicate that the building had been sold to the Government in the late 1980s. He cited the example of Chijmes, the former convent comprising several buildings under conservation and preservation orders that had part of its boundary walls torn down as part of a multimillion-dollar overhaul by a private developer. The URA had approved renovation plans for the heritage site in Victoria Street. Dr Lee said the scheme "does not operate as a restriction of what the Government wants to do". If the Government wanted, it could grant permission for the works despite the conservation order or even delist the building. LTA previously said an expressway needs to be as straight as possible to accommodate higher speeds. 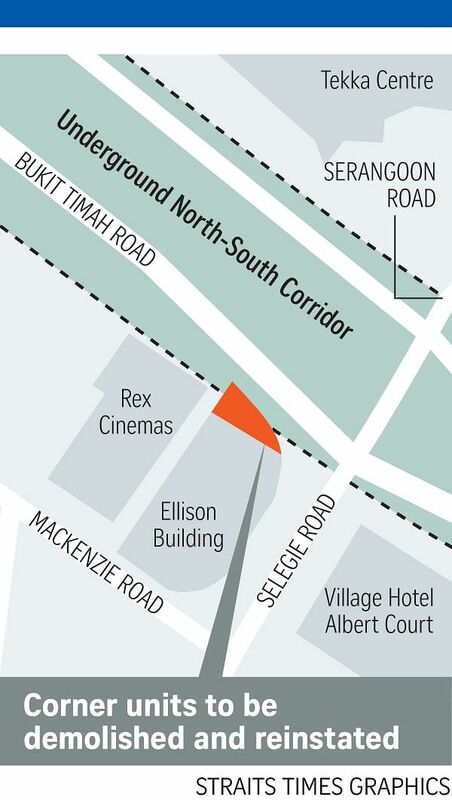 It said acquisitions along the route, including Rochor Centre, were necessary because of the highly built up area that includes Bukit Timah Road and Rochor Canal. Construction of the 21.5km underground corridor, using the traditional "cut and cover" method, is expected to take place progressively from next year. Mr Raymond Toh, 43, the owner of Colonial Bistro Cafe, which has been in the building for the past four years, said he has yet to find a new location. The bistro's lease under the Singapore Land Authority will be up in December. He said it was a pity that the restaurant had to move. "It has sentimental value to both my customers and me. Some tourists who used to live in Singapore and hang out in the area do drop by. They include British servicemen and even a customer who said he was a descendent of the Ellison family."